When a gun is discharged, the bullet is forced down the barrel by the gases of combustion. Both class and individual characteristics are imparted to the bullet, whether it is lead or jacketed. Because lead is softer, one might postulate that bullet markings on lead bullets are more distinctive than those found on jacketed bullets. In actual practice, markings on the jacketed bullets are usually superior, because the jacket of harder metal is less likely to have the rifling marks wiped off by the target. In order to recover bullets for ballistic comparison, bullets were traditionally fired into cotton waste. The tumbling of the bullet through this material may cause a wipe-off of some of the finer individual characteristics if the bullet is made of soft lead. This is especially true for the .22 rimfire bullets. Therefore, ballistic laboratories now fire bullets into water traps, in which loss of fine markings does not occur. The individual characteristics that a barrel imparts to a bullet may be destroyed by rust, corrosion, or the firing of thousands of rounds of jacketed ammunition down a barrel. Accumulation of large quantities of dirt and grease from multiple firings may also alter to some degree markings imparted to a bullet. If a bullet with a diameter smaller than that intended for the specific weapon is fired down a barrel, the bullet will be unable to follow the rifling sufficiently to produce repetitive markings. Comparisons cannot be made, as it is highly unlikely that two bullets will "slip" down the barrel in the same identical manner. If the bore of the weapon is severely rusted, it is possible for serially fired bullets to have different markings. These occur because each bullet strips off rust and changes the surface of the grooves and lands. The material of which the bullet is constructed and the velocity and pressures to which the cartridge is loaded have an effect on bullet markings. Therefore, it is good practice to use the same brand of ammunition as that fired from the suspect's gun when trying to make a comparison. In fact, it is best to use other cartridges taken from the gun or from the same box of ammunition for comparison testing. The reason for these suggestions is that ammunition may vary greatly from one lot to another. The bullets used in one lot may be slightly different in composition from those of another lot. The powder used may be completely different, and the cartridges may be loaded to a higher or lower pressure. Because of all these variables, it is always best to try to obtain ammunition from the same lot as that from which it is to be compared. 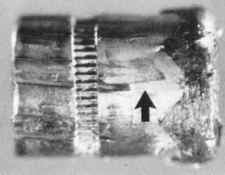 Figure 2.5 .38 Special bullet showing "skid marks." being manufactured for the 9-mm Parabellum and .45 ACP cartridges. Some revolvers have even been chambered for rifle cartridges, e.g., .30 Carbine, etc. Revolvers have been and still are manufactured with the capability of firing different calibers by changing the cylinder, e.g., .38/9-mm, .22LR/.22 Magnum. Semi-automatic pistols have been chambered for revolver cartridges, e.g., .32 Smith & Wesson Long, .38 Special, .357 Magnum, .44 Magnum etc. ; derringers for semi-automatic pistol cartridges (.25 ACP, .32 ACP, 9-mm Parabellum, .45 ACP, etc. ), rifle cartridges (.22 Hornet, .223, .30-30, etc.) and shotgun cartridges. Single-shot weapons have been chambered for a host of revolver, pistol, and rifle cartridges. Rifles have been chambered for handgun cartridges. Double-barreled rifles have been produced with one barrel chambered for a rifle cartridge and the other for a shotgun shell. Shaving one surface of a bullet fired from a revolver is sometimes encountered. This happens because the cylinder of the revolver is improperly aligned with the bore of the barrel (so-called poor indexing) and thus lead is shaved from the bullet as it jumps the gap from the cylinder to barrel. Both cheaply made revolvers and revolvers of quality that are badly worn may cause shaving. In some cases, a bullet recovered from a body is too mutilated to make a bullet comparison possible. In other cases, the bulk of the bullet exited, and only bullet fragments are recovered. In such cases, it is possible by using semi-quantitative or quantitative compositional analysis to link the recovered bullet to bullets from or known to be fired by a specific gun. Recovered bullet fragments can be linked to a bullet recovered from the scene or to bullets from or known to be fired by a specific gun. Scanning electron microscopy with energy dispersive x-ray (SEM-EDX) is suitable for semi-quantitative and inductively coupled plasma atomic emission spectroscopy for quantitative compositional analysis. In some instances, bullets may appear distorted when recovered from a body due to the fact that they were fired in weapons not chambered for them. Ward et al. reported two cases, a homicide and a suicide, in which .38 Special wadcutter cartridges were fired in .30-30 rifles.2 The .38 Special cartridge will chamber and fire in this rifle, though the cases expand and usually burst. The diameter of a .38 Special wadcutter bullet (.358 inches) is significantly greater than that of a .30-30 bullet (.308 inches). On firing, the .38 Special is swaged down to the bore diameter of the rifle resulting in an elongated bullet, the diameter of the bore, with prominent lands and grooves. 1. Nylon-clad bullets were uniformly unaffected by decomposition. 2. Aluminum jacketed bullets were mildly affected but there was no loss of striations. 3. 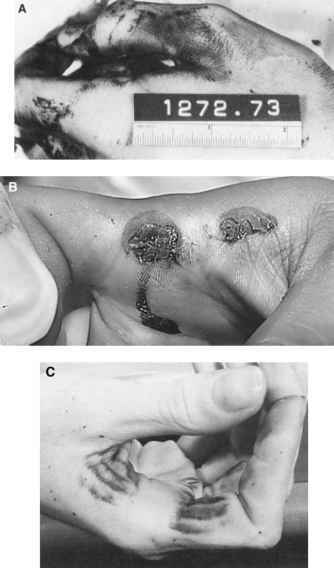 Lead bullets from the brain, chest cavity, and abdominal cavity showed mild tarnishing but were matchable while those from fat and muscle showed dissolution and oxidation to the point of impairing a match. 4. Bullets with copper alloy jacketing, including those with nickel-wash, were not matchable except for copper alloy bullets recovered from the chest cavity which were borderline.